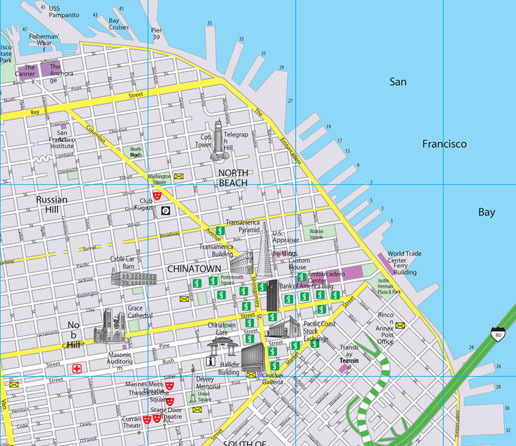 This is a detail section of a San Francisco Street Map that Randal Birkey produced for Rand McNally/Hallwag in 1989 as part of their CityFlash Map product line. This was the first Rand McNally map product produced on desktop computers. Randal and his team used Apple Macintosh FX, CX and CI computers running Adobe Illustrator and Aldus Freehand software. The street map portion of each CityFlash Map included street-level details such as street names, locations of post offices, hospitals, banks, theaters, pharmacies and illustrated points of interest. Also included were vicinity maps, shopping center maps, public transportation system maps, all in an easy-to-use, two-sided folded format. Other cities produced were Chicago, New York, Washington D.C. and Boston.